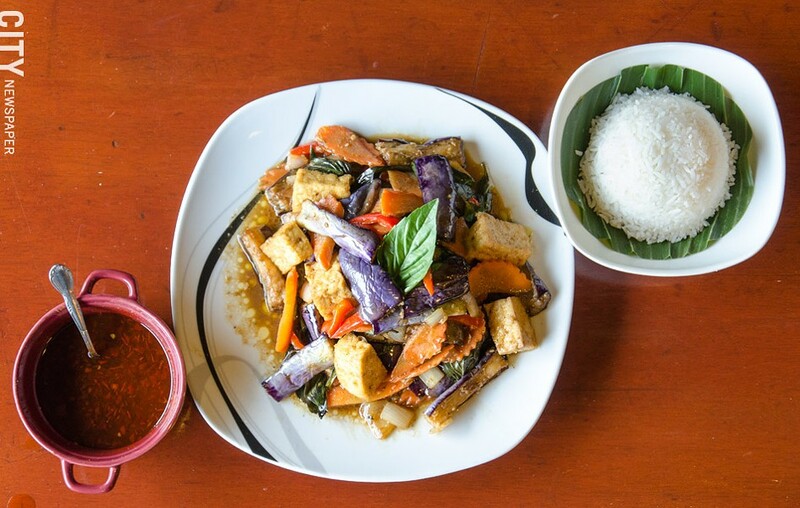 PHOTO BY MARK CHAMBERLIN Eggplant with basil and tofu from Thai Time Cuisine in Henrietta. 2171 W. Henrietta Road | 270-5530, thaitimerochester.com | Monday-Thursday 11 a.m.-9:30 p.m., Friday-Saturday 11 a.m.-10 p.m.
Thailand. In the depths of a brutal winter just the name of the place evokes a tropical breeze. Tom yum, larb kai, som tum, goong yang — even the sing-song names of dishes have a South Seas sort of playful languor to them. And the curries — the relatively safe yellow, the red the color of lava and not much cooler, deceptively mild-looking green — promise heat to warm you from the inside out. Thai food in the middle of February probably won't thaw out your poor frozen toes, but it can make you briefly forget the privations of life up here in the frozen north. And that's why one frigid Tuesday I found myself popping the lid off of a take-out container full of pumpkin-basil curry from our city's newest Thai restaurant, Thai Time on Henrietta Road, inhaling a gust of steam perfumed with the sweetness of pumpkin, the licorice bite of Thai basil, and a host of other spices as I picked up my fork and dug in. Thai Time, a venture by the husband-wife team of restaurant veterans Savat and Dao Tinawong, is a bit of a departure from the norm here in Rochester. You can find the usual yellow, red, and green curries. There's pad thai if you want it. And there's satay with peanut sauce, of course. But mixed in are several dishes you won't find easily in our area. Som tum, a spicy salad of shredded green papaya and carrots in chili-lime dressing mixed with chopped tomato and dusted with peanuts, is not particularly hard to find around here, but everywhere else I've had it holds back on the fish sauce. Also known as nam pla, that unbelievably foul-smelling condiment essential to both Thai and Vietnamese food gives food depth once you do some fancy alchemy with it involving vinegar and lime juice. Leaving it out, or using too little, creates a one-dimensional dish. Savat Tinawong does not pull his punches, and the flavors in his som tum ($7.95) pop like July 4 fireworks, the chili almost dancing on your tongue. 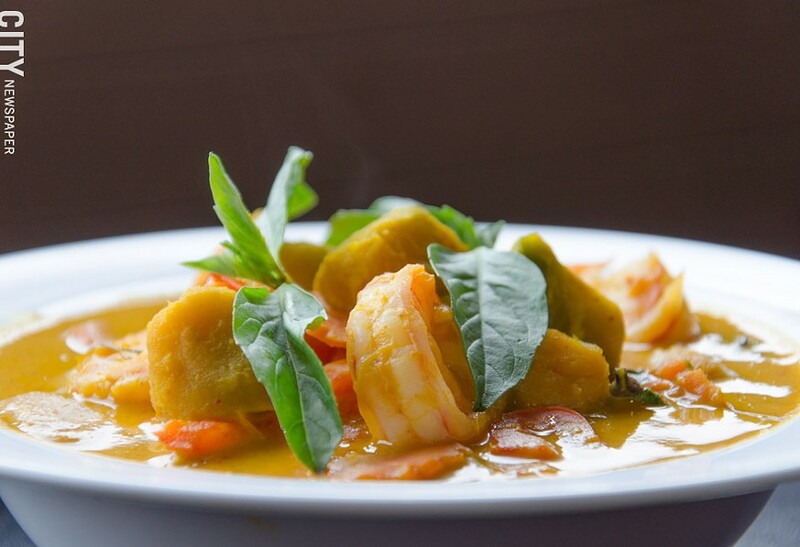 Pumpkin curry with shrimp from Thai Time Cuisine. His pumpkin-basil curry is a also marvel. Chunks of slow-roasted pumpkin stir-fried over intense heat with red curry paste, bell peppers, and a generous handful of Thai basil, this dish — particularly after it is finished with an infusion of coconut milk — is a guaranteed crowd-pleaser. Add in shredded pork or slices of lovingly prepared chicken breast (I will never understand how they make it so tender), and a bit of rice, and you might never need to eat anything else again, ever ($10.95 with chicken or pork). But then you'd be missing out on the larb kai ($8.95), my favorite Thai dish — offered at Thai Time and nowhere else in the Rochester area that I've yet found (if you know of others, do let me know). 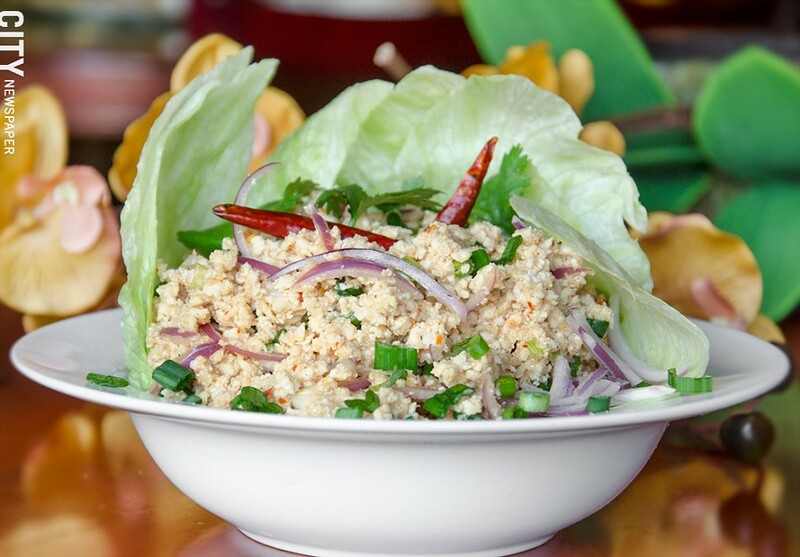 Larb kai is one of those deceptively simple dishes, not much more than a "salad" of ground chicken, chilis, fish sauce, and lime juice tossed with a bit of chopped shallot and sometimes scallions and served cold, often with lettuce leaves to use as scoops. What brings the dish together in some inscrutable way is an ingredient you will never see listed on the menu: toasted rice powder. I'm not sure exactly what difference it makes — it doesn't really taste like anything and its texture is merely gritty — but without it larb simply isn't larb. As with everything else on the menu, Savat Tinawong takes a very judicious approach to this key ingredient, as well as the construction of his dressing, leaving just enough fish sauce aroma in the dressing to be pleasant but not cloying. Even the lettuce leaves are thoughtfully cut into easy foldable triangles, perfect for scooping up bite-sized portions of that amazing chicken. Eggplant with basil and tofu from Thai Time Cuisine. 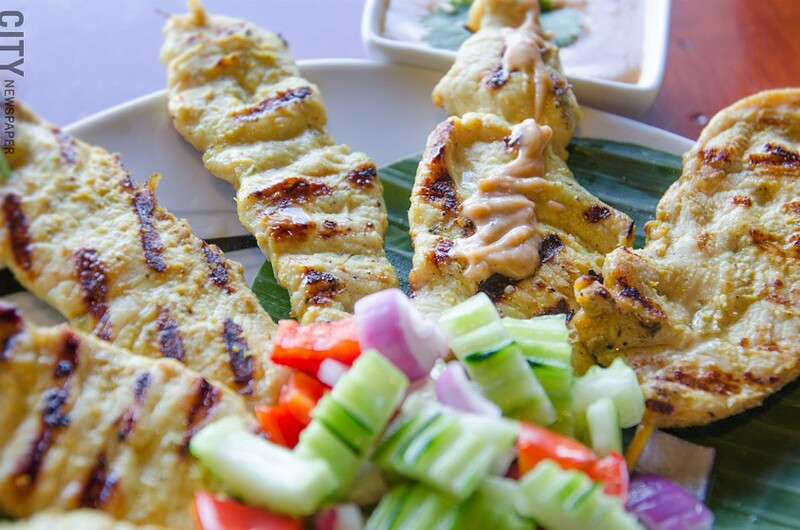 Pork satay skewers from Thai Time Cuisine. The first time I read through Thai Time's menu, I was lulled into a sense of familiarity by the usual names for dishes, the singsong quality of the whole thing. And then I turned to the last page of the menu and ran headfirst into "Dad's Best BBQ Pork" and "Mom's Best BBQ Chicken." I quickly checked the cover of the menu to make sure I was still in a Thai restaurant, and then ordered the pork. Based on a recipe developed by Dao Tinawong's father, this tender, slow-roasted pork ($9.95) redolent of lemongrass and maybe a bit of galangal might inspire you to toss out your barbecue sauce and make a trip to the Asian grocery store for some new ingredients. Roasted and then grilled to give it a bit of smoke, the meat is cut across the grain in thick slices, each of which has a pinkish-red rim of spices that add savor to every bite. Served with rice and pickled carrots and daikon, it really is some of the best barbecued pork I've tasted in a long time. Larb Chicken with Lettuce from Thai Time Cuisine. As I mentioned earlier, Thai restaurants almost invariably invoke an almost tropical warmth, providing a January Thaw to both your body and your soul. And this, unfortunately, is where Thai Time fails miserably. The dining room is painted a dismal battleship grey, and what tiny amount of light that finds its way through the single window dies on the sill. On two visits, the heat in the dining room was apparently never on — on my second visit I was actually sitting next to the heater and touched it to find the radiator stone cold. And the service on my second visit, when I was the only person in the dining room at lunch time, was deplorable. Dishes went uncleared the whole meal. My fork disappeared at one point and I was unable to get a new one from the waitress sitting at the bar watching television for (I timed this) four minutes. I guess in the same way that some people have a face made for radio, Thai Time has service made for take-out.